The want ad isn’t officially posted, but the notice is given: There’s a “great opportunity” for Albertans interested in becoming sheep producers. New Zealand and Australian lamb is filling the void, but consumers here want Canadian lamb and are willing to pay for it. “The Canadian lamb market is looked at with envy because it is one of the highest paying in the world,” said Susan Hosford, sheep industry specialist with Alberta Agriculture and Forestry. Ethnic markets, foodies, and those who want to ‘eat local’ are all driving demand. There are also some attractive factors on the production side, starting with the fact that sheep — on a pound-for-pound basis — are incredibly efficient. And getting them to market doesn’t take as long. “If you lamb in March or April, by the end of the year, you can have those lambs sold, so you can have a quicker turnaround in your finances,” said Gibson, who has been raising lambs for three decades. As well, sheep can flourish on a smaller land base and are easier to handle. They can also make use of other farm buildings (like an abandoned pig barn) while feedlot capacity in the province has doubled in the past year and Alberta has the only federally inspected plant (SunGold Specialty Meats in Innisfail). Still, Alberta’s sheep sector has been slow to develop. 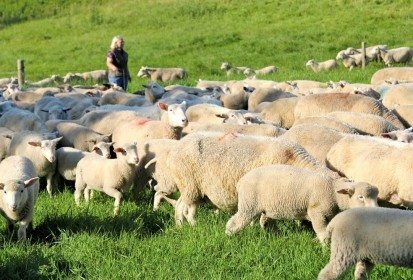 Large flocks account for 70 per cent of production, but most producers are either medium size (200 to 600 lambs) or have small flocks. “The margin in lamb production is there for the top producers,” said Hosford. “For average producers, the margin is there when prices are high. Producers who are in the bottom half of the industry don’t have an excess margin to invest in updating their facilities, systems and equipment. Another issue is that since the majority of lamb hits the market in the fall, prices decline at that time. More experienced producers are able to breed and lamb out of season, but the rest must live with the seasonal price dip. “The prices you get as a producer have a lot to do with the amount of lamb that there is available for the processors right now,” said Hosford. But while it takes about 600 sheep to make a living, they can also be incorporated into a cattle operation. Sheep and cattle can graze together in a so-called ‘flerd’ or be put into a rotation one after another. Sheep are excellent grazers and will clear away weeds and brush that cattle won’t touch. But sheep operations need good handling systems as well as a good fence to keep sheep in and coyotes out. “You need to have your facilities ready before the sheep come to your farm,” said Gibson. Would-be producers also need to do their homework and be aware of things such as shipping costs (which tend to be high) and labour requirements, as well as understanding production (including sheep nutrition and the need to cull hard).